The old Techatticup gold mine in Eldorado Canyon, Nevada is the site of an eccentric, poorly maintained collection of rundown buildings and derelict vehicles. We drove there from Las Vegas in January, curious about this once-prosperous mine, where tours are now the only activity that generates money. On a winter day under a dull sky, the mine looked as forlorn as the surrounding landscape, a landscape whispering of desiccated wood and dreams blown to dust. Perhaps there’s promise around the next bend. Paired with these photographs from the Eldorado Canyon mine are images from Valley of Fire State Park, a preserve about 90 minutes north of the mine. The Mohave desert in January has the spare beauty of subtle colors and gritty textures, quite a contrast to Las Vegas, where bright colors and glitter are the rule. First, a look at the life-giving Colorado River, at the mouth of Eldorado Canyon. This is where ore from the mine was shipped downriver back in the 1800’s. The canyon cuts to the left, out of sight. We’re looking north here, with Nevada to the left and Arizona to the right. Hoover Dam is 15 or 20 miles upriver and Las Vegas is 45 miles northwest. The Colorado River at Eagle Wash, outside Nelson, NV. A Metro van permanently parked at Techatticup Mine, near Nelson, NV. These vans were made by International Harvester, and often used for bread or milk delivery. This one probably dates from 1959 or the early 60’s. A Dodge bus and an old gas pump at Techatticup Mine. The bus probably dates from about 1940. A slot canyon in the sandstone on the White Domes trail, Valley of Fire State Park, NV. Slot canyon, White Domes trail, Valley of Fire State Park. Fluid Drive chrome on a vintage car at Techatticup Mine. I don’t know what kind of car this was, but Fluid Drive was a Chrysler trademark from the 1940’s. Did you know that the three chrome portholes that many of us associate with Buick, are called ventiports? They actually vented heat in the beginning, but later, they were purely decorative. This is probably a 1952 model, perhaps an “archetypal” Buick! Check this out!! A Valley of Fire roadside scene. Peering through the back window of a vintage car at the Techatticup Mine, with a few choice VW camper vans in the distance. There’s also a fake, crashed vintage plane at the mine that was used in a Kevin Kostner film. A late afternoon vista at Valley of Fire. Weathered rock formations on the White Domes trail at Valley of Fire. This photo was taken with my phone and processed in Silver Efex and Lightroom. There is a real mish-mash of objects to peruse as you wait for your mine tour (which I confess I didn’t take). Tourist tchotchkes and historical artifacts jostle for space in several old wooden buildings. Here, old bottles gather light in a window. The Nehi soda bottle on the right is probably from the 1930’s, the Pepsi bottle from the 1940’s. A door knob inside the old store at the mine. A few rocks, and leaves from a Palo Verde tree, have gathered in a sandstone crevice at Valley of Fire. All that’s left of a desert shrub is this elegant skeleton in the sand, at Valley of Fire. One of the old mine buildings at Techatticup, with an assortment of rusted parts, animal skulls, and old wooden items scattered about. The Metro step van seen in #2. Bales of hay have been dumped just in front of the van, so maybe it still runs! On the road, approaching Valley of Fire State Park. I take a lot photos from the passenger seat, but for this one we stopped and I got out. The road was quiet enough that I could stand in the middle and get low for a more interesting angle. Processed in Silver Efex and Lightroom. On the road again, threading through a canyon at Valley of Fire State Park. It was almost noon and the sun was bouncing off the sandy road, an effect I emphasized in processing. This entry was posted in photography, travel and tagged Eldorado Mine, Nevada, Valley of Fire, vintage cars. Bookmark the permalink. It is I guess, but I was disappointed by the way everything was helter-skelter and no effort seems to be taken to look after things. On the other hand, it’s good that the owners are preserving this piece of history, so who am I to complain? An interesting place to visit! Your photos are great and I love the rugged landscape…. Wonderful shots of this stunning area…my favourite being the ‘road’ beautiful and so well processed. But these are beautiful shots – – lots of silver! – the old trucks and chrome detailing, soda bottles, that gleaming doorknob. So Robert, next time I’m at a loss for words, I’ll come to you! You’ve just really added to the party here. 🙂 Thank you very much for noticing the abundance of silver – true, and how interesting, given that silver was mined at the mine! And I didn’t connect Fluid Drive with the road either, but you’re right. Thanks for making those associations. Lynn, I absolutely adore this series! The old vans and trucks, the arid landscape, the fabulous rock formations. How I love this kind of landscape, especially as shown in 8, 9, 12 & 13. This makes me anxious to get out west for my Four Corners trip in May! The black and white series is fabulous as well. Your photography, as always, is amazing and inspiring. ~Cathy~ (I’m now writing from my new blog, where I’ll be from now on). You’ll have a great time, Cathy, I’m sure. You should see plenty of equally beautiful landscapes, and if you do your research (which I know you will) you should be able to find a few ghost towns or old mines, to visit, too. I’m glad you enjoyed the post. Cathy, I KNOW you can find them – just google ghost towns with the names of the areas/counties/towns you’re traveling through – and to narrow it down, you can always find the spot on google maps and zoom in with the satellite view to see what’s actually there. Sometimes a so-called ghost town is only a building. Of course there are the isolated abandoned buildings you pass on the road, too. Hope you’ll be able to stop for some of those! Of course, I love the cars, even derelict ones. But my favorite shots are of the slot canyon (4 & 5). Again, another excellant series. This was a very productive trip (photographically) for you. Nice work! I certainly thought of you when I photographed and processed those car photos, Ken. I’m pleased you like the slot canton photos – they were a bit difficult, since the light was very harsh at the time. Processing, processing! 😉 Thank you, thank you!! Harold, it’s great to see you here…I cannot keep up with your writing and feel bad about that…and I enjoy your photographs, too. Thank you!! Very nice reportage! Old cars; beautiful landscapes and fine details. Nr 21; the white road, is my fav. ; beautiful dynamic shot. See you! Thanks Harrie, I appreciate your thoughts. Have a good weekend! This is a marvellous series, Lynn! Perfect combination of black and white with reduced colours, fine textures and details. You evoke a completely forlorn atmosphere by your photos, that I especially love. And your text again! It is so good to read rich and expressive language. Thank you! So different from anything near you, I imagine. I really appreciate your thoughts about the text, too – it’s a struggle, but I like combining image and text, as I know you do. I’m glad you enjoyed this – thank you, Ule! I’ve spent a long, long time looking at this post because there’s such a lot to drink in! Very interesting notes, too (I love those Buik Ventiports) – but as usual I wish WordPress had a post format that let’s us automatically slow down and look at each image in isolation, because these are so beautiful, so strong. Now, I click on the first image and view all of the one at a time in the gallery so I can take my time. They’re breathtaking – especially the Mohamed desert. I shall keep coming back to this one! Goodness, sorry about all the typos. Spell corrector had a field day with this one. I was especially not looking out for ‘Mohave’ becoming ‘Mohamed’! But then again there’s meaning in that, that I hadn’t thought of either.! 🙂 Yes, that was a good one, right? I knew what you meant…and I really appreciate your comments. Thank you! It looks like a sad place. Fantastic landscapes and beautiful photo’s! It can feel pretty desolate, but I suppose the time of year, the weather, and your mood all can make a difference. Still, it’s a very harsh environment, and it must have been really tough on the first people who came out there. I’m glad you enjoyed the post – thank you! Love the depth in 1and 20. Nice intro to the pics, which gave an extra perspective. It’s b–i–g country! So you can find scenes with a lot of depth without too much trouble. 😉 I appreciate your telling me that the text is helpful – thank you, Ken! Your picture #7 reminds me of the 1954 Buick I drove in 1964. On a rural Interstate in Maine I briefly took it up to 110 mph, the fastest I’ve ever driven. At that speed the old car made so much noise we couldn’t hear the radio. You know I’m always glad to see pictures from the Valley of Fire, a place I hope to return to. OMG, that’s hard to imagine in one of those old cars. We had a 54 Buick at some point, but it was long gone by the time I was driving age. Handsome cars! The Valley of Fire is really beautiful; I didn’t have enough time there either. I do have more photos – maybe I’ll do another post at some point. Thank you, Steve. My old VW Rabbit topped out at around 95 but it took a while for it to get up there. (My nephew broke his arm and I was determined to get him to a hospital as fast as possible). That’s my story and I’m stickin’ to it. 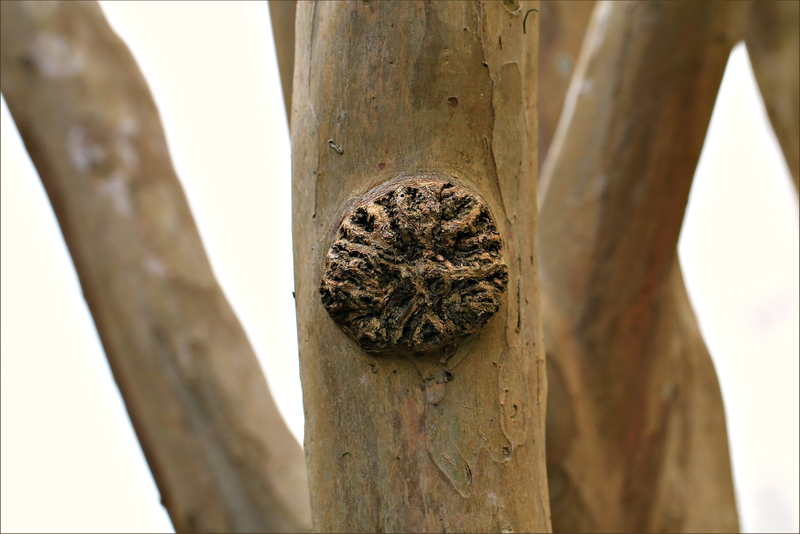 For some time, I’ve been trying to identify what the crepe myrtle scar I photographed reminded me of. I’ve not been able to pinpoint it, until I saw your photo of the doorknob. That’s it. I was tickled by the juxtaposition of the newish “Authorized personnel only” sign and the crumbling mine at Techatticup. Could non-authorized personnel be attempting to bring the mine back into production? Of course not. On the other hand, what would today’s personnel be authorized to do? So many questions! — but it does make me wonder why they didn’t choose a simple “No Trespassing” sign. A very different selection but I enjoyed the trip. Yes, that part of the world is radically different from my own, and the mine is a peculiar place, but it was fun. That #10 and your observation makes me think it would be interesting to do a series taken through car back windows, focusing on the front window visor, or playing with other places to focus on. In our spare time, right? I’m glad you saw the cartoon, I thought it was so charming…apparebtly the mice coming out ot he portholes referred to actual events, in the beginning, when they vented hot air…maybe in cold weather mice would hide in there at night, then…like when we found a family of raccoons sleeping in the car very early one morning, after leaving the windows open by mistake overnight. And that was within NYC boundaries! 😉 Green thoughts shooting up to snowy etown, Hedy! Thanks Dave! I may have an Arizona post coming up, also with some black and white – that desert landscape and things you find in it, lend themselves to the monochrome treatment. Happy Sunday to you! Well done Lynn, you always have such a nice mix of pictures! 🙂 Always so nice to drop by. How else to describe it but derelict, but intriguing all the same. You have a knack for drawing us into your vision. It will likely come as no surprise that I was most pleased with 1, 9, 12 (!!!) and 17. Oh heavens! I’m so glad you didn’t break any bones. Who would have expected such rabbit warrens in the sand? You make me want to travel! And that image of the glass bottles, sublime. You’re busy, I know, but I do hope you can get away, because I know you’ll do wonderful things with what you see. Thanks Niki! Beautiful images and beautiful desert landscape 🙂 . It appears as if a modern civilization, with cars and trucks, recently got extinct and rediscovered again. Such a nice experience. 🙂 Well, it would be even better if you went to the mine outside of tour hours, very early or late in the day. There wouldn’t be anyone around, and the light would be nice. But we do what we can with the experience we have, right? Many go to Vegas not seeing anything but the casinos, shows, and hotels. Very few even know about Valley of Fire, let alone going there. Your shots and dramatic interpretation of it should make them aware of what they miss. Lynn, this is such a wonderful series! I especially love the old vehicles, and the colors and tones in each are just beautiful. Thank you Lisa – it certainly is a good place to immerse yourself in a subdued color palette! And mush of it probably lost, but at least the vehicles are sort of corralled into one place. 🙂 Thanks Julie! Surprisingly (or not) my faves are the wide-open and the close-in, 8, 10 & 15, though 18 & 20 are super-snazzy. Can’t really pick. Never can. Why must I? So many good shots in one post! I love #16. I love these photos from Techatticup gold mine. They tell a story of dreams, abandonment and longing. Some time ago I visited Valley of Fire State Park, but I missed out on the abandoned mining town. Wow, how did I miss this post? Truly wonderful! I would love to visit this place. The road image is awesome. They are all amazing. They really take you there. What a contrast with the images of flowers, etc, from the Transient-Beauty post! Scrolling down while pondering your words, thought of the book, Angle of Repose, and the hard life of any man or woman who lived during those frontier days. I paused and admired those old bottles, and in my mind’s eye, I filled them with water and placed lone stems of flowers in each one! Yes, a contrast – I’ve always been drawn to opposite things, like city streets and wilderness. :-). I don’t know that book – I’ll have to look it up. What a nice fantasy with the bottles…and perhaps one rose would be faded…. The old vehicles work so well in monochrome. That’s what I thought when I saw numbers 2 and 3. But then you throw numbers 6 and 7 at us, and color seems just right. So go ahead! Whatever! I’m sure I’ll like it! Same thing goes for your landscapes. My favorite photograph here is number 16, but also high on the list are 7 (love the colors), 11 (like the tight crop), 12 (that shaft of golden light amid the other subdued colors), 17 (the radiating composition), and 21. I’ve seen hundreds of photographs of curving roads cutting through rocky landscapes, but you manage to make this one special. For me it’s probably because of the high contrast and the sweet side road coming in from the bottom right. Another praiseworthy collection, Lynn. Thank you for sharing your impressions, Lynn. Every photo tells a story, of the people who once lived here, and of the beautiful but unforgiving land. I love the American West, there is no other place quite like it. And there are so many places to see! I’m glad you enjoyed the post, Tanja, thanks so much! Great photos! I especially enjoyed the ones with the classic autos. Those old delivery trucks sure do capture a certain feeling of auto nostalgia.